Soft pears, perfectly smooth and rich filling and a crust made from gingersnap cookies, this pear cheesecake is a fabulous dessert to enjoy year round! Do you know what day is today? It’s National Cheesecake Day!! One of my favorite days of the year! I’ve mentioned lots of times chocolate cheesecake is my favorite dessert of all time, but truth be told I love cheesecake anything. For me cheesecake is one of those desserts I could eat every single day despite several other sweet options in the house. There is something magical about the velvety filling that gets me All.The.Time. Other reasons why I love cheesecake? – it comes in so many flavor combinations! Chocolate cheesecake, dulce de leche cheesecake, candy cane cheesecake, biscoff cheesecake to name just a few! – the filling can be made using various types of cheese. In addition to the standard cream cheese, you can make ricotta cheesecake and even goat cheese cheesecake! This pear cheesecake is one of my favorite cheesecake at the moment. It’s rich, creamy and smooth, just like a cheesecake should be with lots of roughly chopped soft pear pieces and a touch of ground ginger. I love pairing pears with ginger but if you’re not a big fan, you could use cinnamon or nutmeg instead. Despite its long list of ingredients, this cheesecake it’s actually fairly simple to make. The classic graham cracker crust is substituted by gingersnap crackers mixed with melted butter. Press evenly on the bottom of a 13X9″ baking pan. No extra sugar added and the crust requires no pre-baking. Just refrigerate while you make the filling. For the filling, you’ll have to make the pears first. After they have been peeled and cored cook over low heat in a sugary water until just begin to soften. Remove from the stove, drain and let cool. The cheese filling not only includes cream cheese, but sour cream as well. For a silky smooth filling, it’s very important to remember to have the ingredients at room temperature. Now, that it’s summer time, leave your ingredients out for about an hour or so. You also have to keep in mind a light beating is all it’s needed. If you over-mix the cheesecake filling you’ll most likely end up with cracks. Speaking of cracked cheesecake, making bars seems a whole lots easier and less likely to crack. If you prefer a round cheesecake (for a 9″ springform pan) half the recipe. It should work like a charm. Line a 13X9" baking pan with parchment paper, leaving about one inch of paper hanging from the sides. Set aside. In a food processor add the gingersnaps and pulse until finely ground. Pour in the melted butter and pulse for few seconds. Remove for the food processor and with your fingers (or the back of a spoon) press evenly in the bottom of the prepared baking pan. Refrigerate while you make the filling. Peel, core and roughly chop the pears. In a small saucepan, add the 1/2 cup sugar, water, lemon juice and the pears. Bring to a boil, reduce the heat and simmer until the pears are tender but not breaking up. Remove from the heat, drain and cool completely. In a mixing bowl, add the cream cheese and the remaining 1 cup sugar. With the paddle attachment on, beat on low speed until smooth. Stir in the eggs, one at at time, scraping the sides of the bowl if needed. Last, beat in the sour cream and the ground ginger. Arrange the pears over the crust, pour the filling and bake the cheesecake for approximately 50 minutes or until set. Turn the oven off, slightly open the door and leave the cheesecake to cool in the warm oven for at least 1 hour before removing. For a fancy look, top each cheesecake bar with whipped cream and a dust of ground ginger. 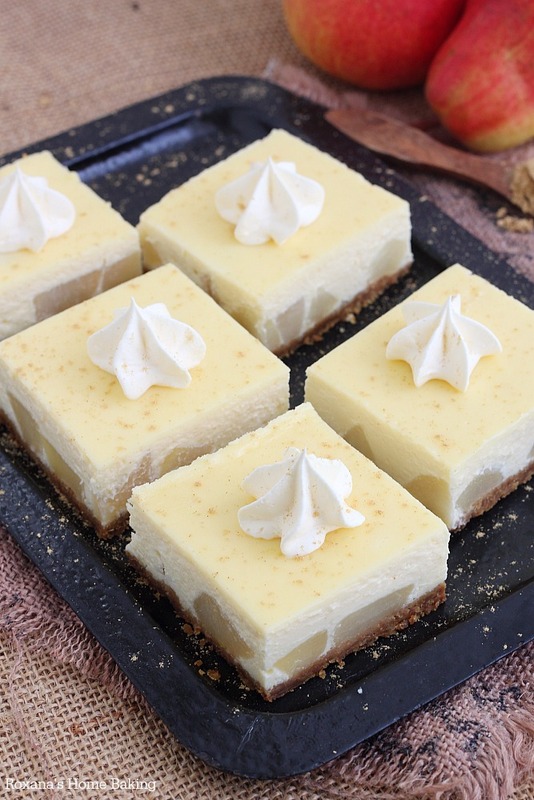 Check out all these amazing cheesecake recipes my friends are sharing today! 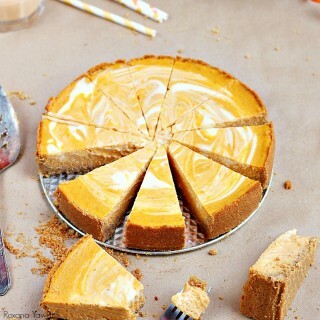 Follow Roxana | Roxana's Home Baking’s board (Cheesecake) on Pinterest. Wow, Roxana! What a beautiful cheesecake! It looks delicious. Thanks SO much for all your hard work coordinating all these wonderful Cheesecake Recipes on the same day! You rock! I seriously need some new ways to eat pears...I always forget about their existance. Put anything in a cheesecake and I am one happy camper...especially with that gingersnap crust. I. am. dead. Pinned! I love the pears in this cheesecake-such a fun twist! Thanks for organizing such a fun day! 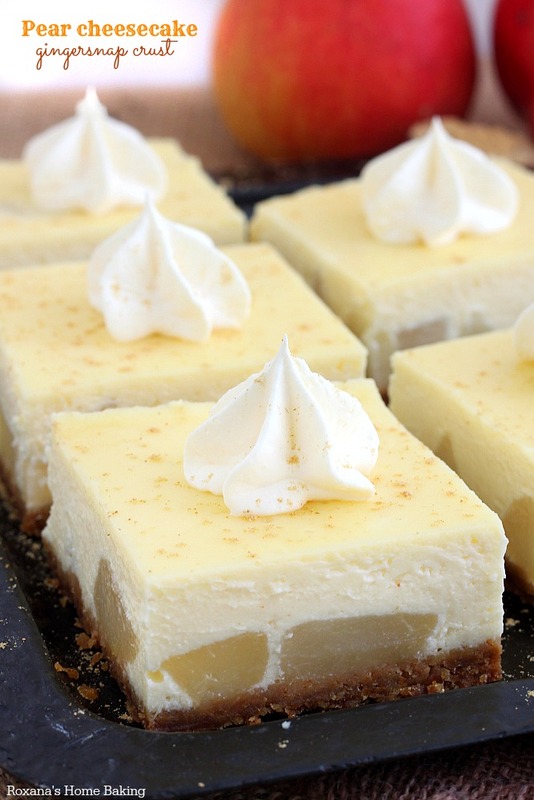 These cheesecake bars are gorgeous! I love the gingersnap crust, and the filling looks so creamy and delicious! Thank you so so much for hosting today! What an awesome day to celebrate, and what a fun group of friends to celebrate with!! I love that you used pear and gingersnap in your cheesecake! Two flavors that pair so well together and I'm sure make this cheesecake OUT OF THIS WORLD! I love pears and I'm sure pears in a cheesecake would just be over the top. Have a great day Roxana! 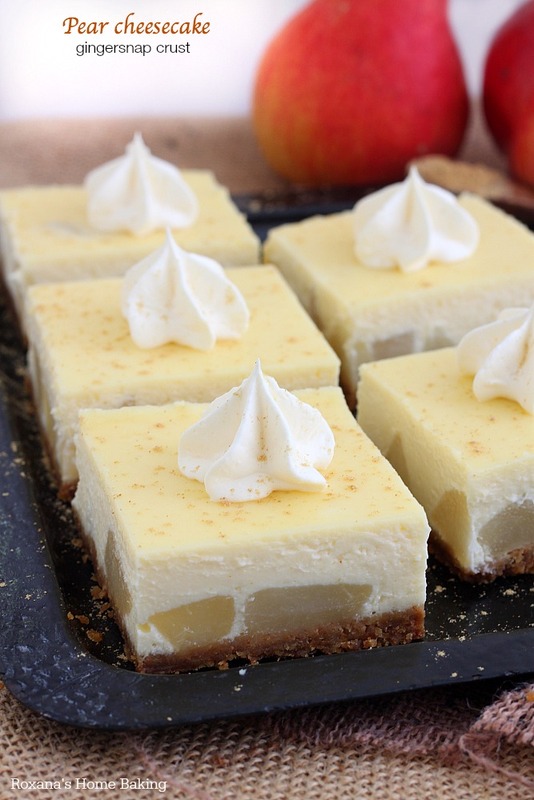 I love cheesecake for it's endless combinations...LOVING this pear and ginger version!! Love that gingersnap crust, Roxana! It goes beautifully with the pears and the cheesecake filling. Thanks so much for organizing this great celebration! I love a gingersnap crust! 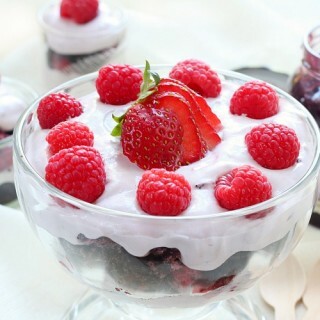 This looks delicious, Roxana! Thanks so much for organizing the cheesecake party! This is such a great combination. I've never had pear in a cheesecake before and this looks amazing! Thanks again for pulling all this together. Holy Moly Cheesecake recipes! I am with you. Cheesecake gives you so many options and flavors. You have to love it. Love the chunks of real pears and the texture they'd add! Thanks for all your hard work in setting up Cheesecake Day! This is going to be my husband's new favorite cheesecake. He loves pears. Looks awesome! What a great combination for cheesecake bars! I love pears! Roxana, these look amazing! I LOVE the gingersnap crust! It's making me think of what else I could fill it with. Yumm! Thank you SO MUCH for all your hard work organizing Cheesecake Day! Pinned! This is such a great combination of flavors!! Oh my!! And thank you so much for organizing such a wonderful party!! What a great and creative combination of flavors! Roxana, I love seeing those big pear chunks in the cheesecake. . this is perfection and beautiful!!! love love love! thanks so much for bringing us all together today! so fun! Roxana, thank you so much for organizing today's event. Celebrating cheesecake day with y'all has been so much fun! And girl, your cheesecake is too legit to quit. I LOVE the gingersnap crust, those soft poached pears that must melt in the mouth, and that smooth, creamy cheesecake. Your photos are gorgeous too. My husband, who loves all fruit desserts, would be all over this unique, creative recipe! Pears and gingersnaps sound like they are perfect together! Wonderful cheesecake! This is quite the impressive cheesecake! Thanks for organizing the whole day! I absolutely love the flavor combo you have here, Roxana! Pears and ginger - yummers! THANK YOU so much for organizing this event! Best food holiday ever! Pinned! Oh Roxana!! Look at those fabulous chunks of pears in the cheesecakes... what a combo!! The ginger is just a bonus. An incredible recipe and an awesome day to celebrate!! Thanks again Roxana for organising this amazing round up! Your cheesecake looks beautiful and I'm loving that crust! I don't think I've ever had a pear cheesecake before! Sounds perfect as August is here now. Thank you for coordinating this event! One of the best days ever. Oh, I love that you used pear. How delicious!! 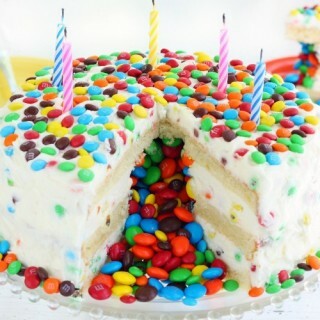 That looks so delicious, I would love two pieces please!! Thanks for organizing such a fantastic event!! Cheesecake rules!!! You are one killer hostess, Roxana! It was such a privilege to join all of you for cheesecake day--this pear cheesecake is seriously making me drool all over my desk. Good thing I have some pears to use up! I can't wait for next year, and any other events at which we might meet up. Cheerios! Thanks so much for arranging Cheesecake Day! It was a lot of fun and I'm looking forward to the next Food Holiday! What a beautiful recipe and I love that you added pears! Thanks again for including me in the celebration. I just love the combination of ginger and pear together! These look absolutely perfect, and I'd love to just grab a fork and pull up a chair. YUM! These bars are so pretty! I love pears and have never thought to put them in cheesecake. Using cookies as a crust is so great because you can get so many different flavor combinations, instead of just the graham cracker crust. Even if this wasn't a cheesecake, I'd still want this for the pear and gingersnap combo. Oh man, this is like a dream come true. Weekend bake-a-thon here I come! You shouldn't steal recipes if your copying a recipe tell where you got it from! This recipe was featured in a magazine in 2006. Using a recipe as your own is wrong. Hi Janelle, I did not steal this recipe. There are not that many cheesecake recipes that use this combination, but I would be more than happy to check out the one you mention. Is it found online? I came to US in 2008, so a magazine printed in 2006 has very few changes to come my way.